The sun's rays can be harnessed to power everything from homes to gadgets, but one graduate student is using the sun to create a super-printer capable of printing elaborate glassware. 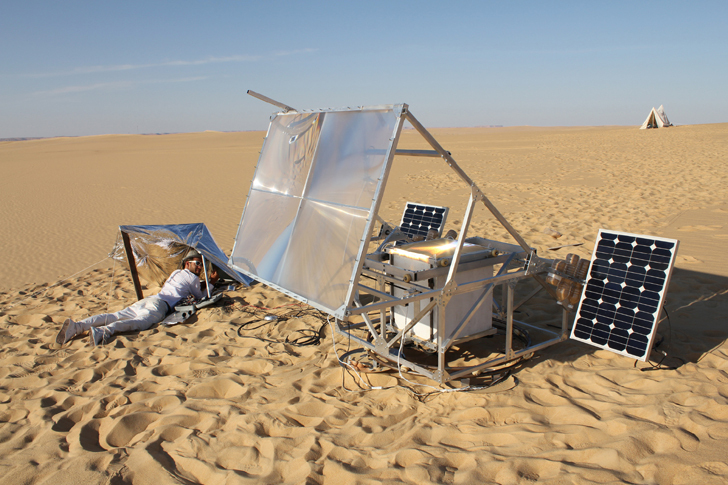 Markus Kayser took his graduate project all the way to the sands of the Sahara in Egypt to create his innovative idea dubbed the 'Solar Sinter'. The incredible design uses a 3D digital printer and the sun’s rays to turn the sand into incredible glass bowls and sculptures that are out of this world. The Solar Sinter is made up of seven stations: a photovoltaic panel, the focal point for drawing the sun’s rays, a sun tracker, fresnel lens (for magnifying the rays), a battery, controlling electronics, and finally a silver tent dubbed the “office,” where Kayser can shield himself from the hot sun, while monitoring the process. Dragging the mini-station far into the desert, Kayser utilizes the abundant natural energy. The 3D printer has the capability of creating any shape, be it bowls, sculptures and even furniture. The machine is able to turn a remote desert area into a high-tech production facility for high-end design. Inside the solar powered 3D printer, the sands of the desert replace traditional resin in the production process. The sands are melted and molded into varying shapes using the 3D printer. The entire process is as beautiful as the objects themselves, beautifully glowing and transforming as the sands melt together, evoking footage of the birth of stars in space. Kayser is dedicated to creating projects that seek to prove the possibilities that lay in the use of solar and desert production, and above all, its endless supply of raw solar power. His previous project, Sun Cutter, used the sun’s rays to make delicate cuts in wood, like a fine laser. Can you all see what amazing things can be accomplished when a great mind creates things for the GOOD of mankind? This is a GENIUS device !! I live near a desert? I think I should get one of these furnaces. Could I heat my home with this? And, can I even buy one of these or do I have to build it? OK, I'm really impressed. I only wish we could see the final polished and cleaned piece. Rocdad: there is no resin involved. The sun's concentrated rays are used to fuse the sand grains together. It's basically the same principle as used in 'traditional' glass factories (where glass is made from particular types of sand (and some extra stuff like lime, soda, etcetera)). But in this case, the heating is done by concentrated solar instead of gas or electrically heated furnaces. So, no fumes. Is this an Onion? : Seems there would be a lot of smoke and heat produced supposedly in a printer designed to use warm resins? Very cool. I'm imagining solar-sintered building blocks, maybe even whole buildings if the armature can be scaled up. I wonder if the outgassing from the sintered glass amounts to much - probably no more than what comes out of a volcano, and probably less... It would be nice to see a video of the process. I think solar power and renewable energy is amazing; it has forever changed our world. 3D printers are also changing how we view virtual ideas and objects. I love how these two things are coming together and creating models. 2BOT is using reusable materials in their 3D printer, the ModelMaker. The blue wax can be melted, after the model is made, and reused for other objects. The Solar Sinter is made up of seven stations- a photovoltaic panel, the focal point for drawing the sun’s rays, a sun tracker, fresnal lens (for magnifying the rays), a battery, controlling electronics, and finally a silver tent dubbed the “office,” where Kayser can shield himself from the hot sun while monitoring the process. Dragging the mini station far into the desert, Kayser utilizes the abundant natural energy. The 3D printer has the capability of creating any shape - be it bowls, sculptures and even furniture. The Solar Sinter turns a remote desert area into a high tech production facility for high-end design. Inside the solar powered 3D printer, the sands of the desert replace traditional resin in the production process. 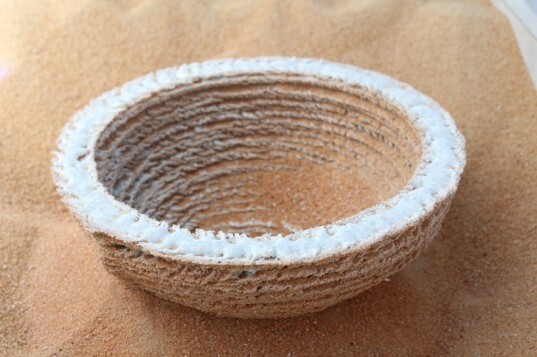 The sands are melted and molded into varying shapes, and bowls using the 3D printer. The entire process is as beautiful as the objects themselves, beautifully glowing and transforming as the sands melt together, evoking footage of the birth of stars in space. Kayser is dedicated to creating projects that seek to prove the endless possibility of solar and desert production- and its endless supply of raw solar power. His previous project, Sun Cutter, used the sun’s rays to make delicate cuts in wood, like a fine laser. The Solar Sinter is currently on display at the Royal College of Art.